Heavy Duty Weed Control Fabric in a variety of materials to suit a number of needs including weed protection, under-decking and pathways. We offer a range of sizes, effective and easy to set up, protecting your soil from greenery and deterring digging animals. Materials include polythene, polypropylene, maize starch and HDPE (high-density polyethylene), offering different but long-lasting features. Under – decking Make sure the soil is free of any greenery, including roots (you can use weed-killer for this) then rake the soil flat before unrolling. Plant Protection Make sure the soil is free of weed, after that flatten it and smooth it with a rake. Unroll the fabric, cut it to size and weigh or pin it down. Cut ‘X’ shapes in the fabric where you want to plant, fold the flaps over and once planted, return them over the top, maintaining as much UV cover around the existing plant as possible. How do weed membranes work? Simply, the membrane acts as a barrier for sunlight which will not allow them to grow around your crops or plants whilst allowing air and water to pass through, giving nutrients to your plants. What are the advantages to the various materials you offer? Plastics such as polythene, polypropylene and HDPE are UV resistant and will not degrade as natural products would, meaning that it will last considerably longer. This product can last up to ten years before degrading, meaning that when you are done with it, you should dispose it in a green-way by having it recycled. Would I get the same effect by using chemical methods? Yes and no, although chemicals are proven to effectively deal with greenery there are consequences for this. Using harmful chemicals can easily get into the local food chain and cause damage to local wildlife, this is the key advantage for using this product. They also require less attention, which is perfect for industrial and irregular domestic use. Will this protect against greenery 100%? No. There is no method that is truly 100% effective. 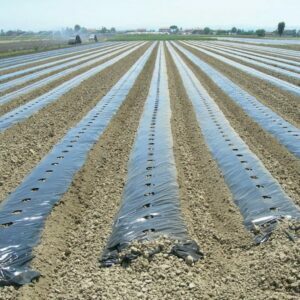 However, the only reasons why this method would fail are if there are tears in the fabric, of which our HDPE is especially resistant to, or there is soil on top, which will attract greenery. What does gsm mean in regards to the weight of the product? Gsm, or grams per square metre, is the metric measurement for fabric and relates to the weight of the fabric for every square metre. In this case, 50gsm. Will this membrane fray easily? No. If left uncut, the woven construction will not fray, if you are using this product and are concerned with strength, we recommend you consider our high-density polyethylene. What is the best way to lay or attach the membrane? You can use a number of methods for this. Some use bricks to weigh down the corners of the material, others lay a layer of bark across the top (when doing this it important that your plants are able to grow through holes which you have cut) or you can use pins to plant the membrane into the soil.